We are currently closed, will reopen on April 18th. 1966 - 1967 Window washer bottle, the "correct" size! This is the CORRECT size washer bottle, and is not the same as the "other" one being offered elsewhere. Entirely new tooling, correct strainer, and strainer tip color. Also has correct surface texture and snap lid. Note the attachment points have the correct plastic washer as well! 1964 to early 1966 Windshield washer reservoir. Picklefork wipers for you type A guys! 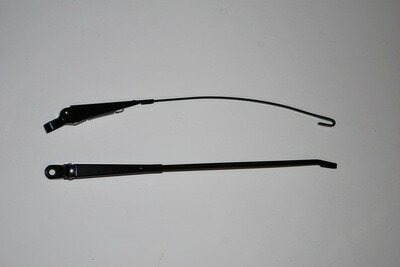 Now you don't have to spend half your restoration budget just on a set of wipers for your 56 to 59 356! Completely new tooling, not just re-purposed VW parts! Correct "christmas tree" rubber, narrowed center beam, and correct clips on the blades. We offer both Speedster arm lengths, and also the longer version for Coupe, Cab, and ConvD. 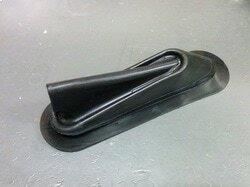 356A Short inside door handle, for Carreras, GT cars, Outlaws and those who just want to be a bit different. Found mostly on special order cars, Carreras, ConvD, and 58/59 Cabriolets, but fit all the inside door handles from 1950 to 1965. There's a few threads on these on the 356Registry. Only a few pairs left.., complete with covers as seen in the lower image. Beautiful chrome, all correct details on lenses, and BACK of the lenses! 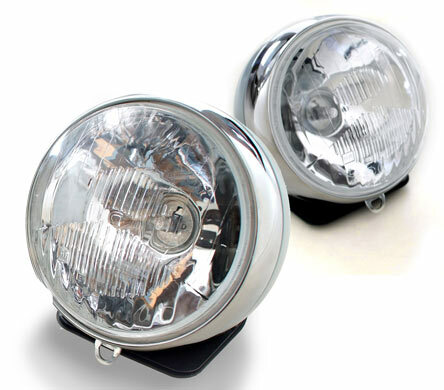 These come complete with bases and bulbs ready to mount to your Rally or Safari car. $750 a pair, with covers (a few pairs of covers in stock to go with lights)! Our stock of Cibie covers for separate sale will be back in stock in mid April, $60 each. HORN GRILLS FOR 1969 TO 1972 THAT ACTUALLY FIT! The cheap ones don't!!! NEW ITEM! HORN GRILL FOR 1969 TO 1972 AND IT FITS!!! we used original grills to create our tooling and these grills absolutely fit perfectly between the hood and the turn signal! 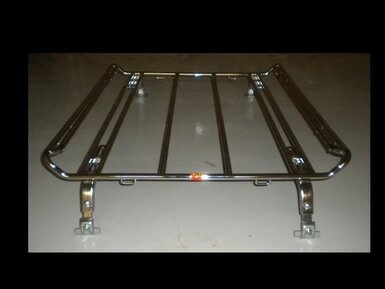 We've done all new tooling and made the grill the correct size, with very nice chrome, done right here in the USA. 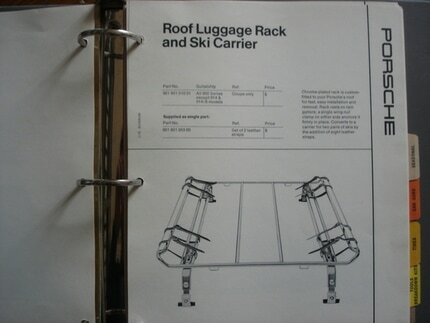 Priced at $85 each side. Back in stock! Absolutely correct dimensions, holes pre-drilled, and the rubber is correctly cut to fit for easy installation. Absolutely concours correct, flawless chrome, all correct numbering, and logo on the glass. Inside of the lights is as correct as the outside with correct markings on the backside of the reflector, even correct manufacturer stampings on the inside of the stem that can't be seen without opening the lights! Finally an option to the later model boot for the early cars! This one is absolutely correct for 1968 to 1973. 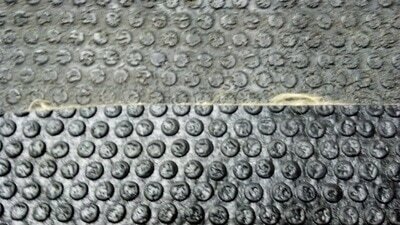 All correct molding seams and fits under your rubber tunnel mat or carpet. Molded slits for the throttle and heat levers. 128 FOG LIGHTS, OUR OWN PRODUCTION! Concours quality chrome, correct raised lettering and logo. 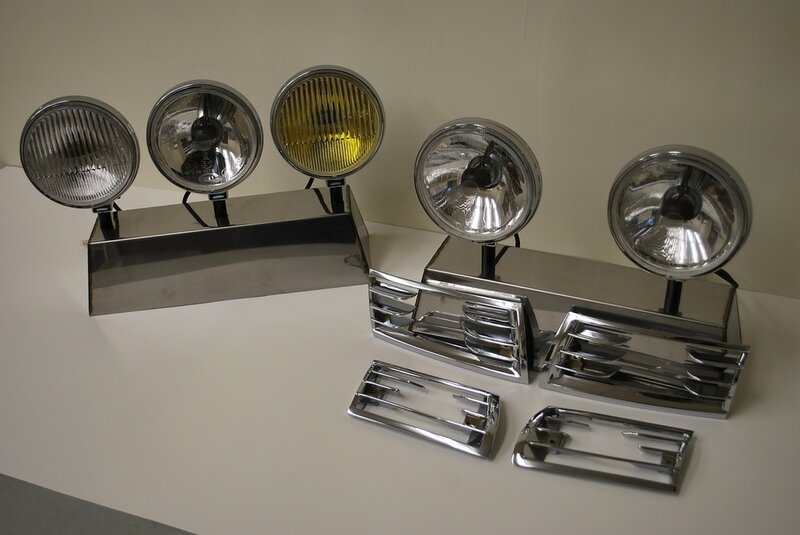 These are not the same lights offered by others, these are our own production and are beautiful quality, with absolutely flawless concours chrome! Bulb included, either 6v or 12v. $310 per pair, $360 per pair with amber reflector. Correct reproduction of the very hard to find spark plug wrench for mid 1965 to 1968 911 in 10mm hex head. Absolutely correct details and finish. Also available in 12mm version for 1964 901 and very early 1965 911's. correct for 1965 to Early 1971. 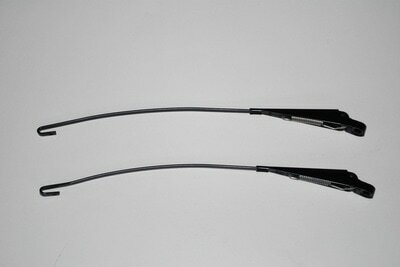 Correct dimpled face, heat resistant, and the material is German TUV approved. We've been offering this part for 6 years now, with perfect results. we are the only one with the correct pattern, using an original as our template! Back in stock! Please call or email to purchase, $350. Headlight attachment screws for 65-67 Euro and USA and H4 and H1 headlight assemblies. This is the factory style headlight screw for the 65-67 USA and Euro headlight assembly. ​It's also the factory style headight screw for the chrome trim ring H4 and H1. 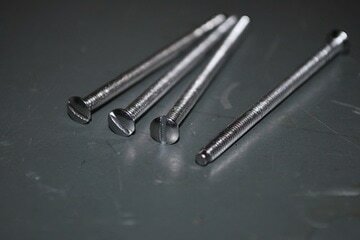 Headlight adjusting screws, for early 911 to 1968 and 356 1954 to 1965. 65mm length, pilot tip, correct brass with chrome plate. Phillips version in stainless also available, please ask. Also, $20 pack of 4. Correct reproduction of the original SWF wiper arms, painted in silver. Each arm is "handed" so that these are correct for either left or right hand drive (just like the originals were). 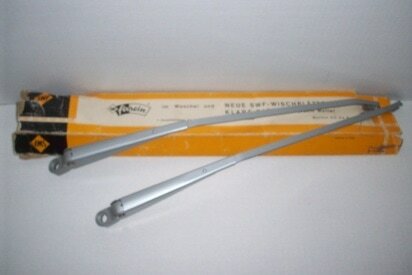 Perfect reproduction of the original SWF silver wiper blades for 1965 to 1967 911 or 912. 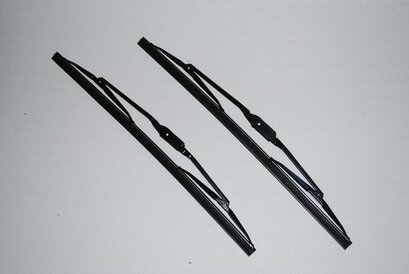 Wiper Blades for 1968 to 1977, Perfect SWF reproduction. 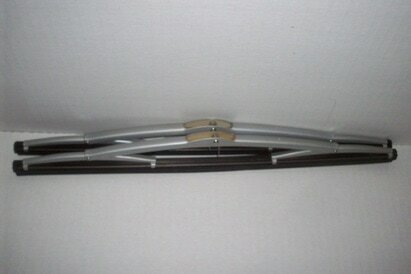 Exact reproduction of the wiper blades that came on your 1968 to 1977 car. If you're going to put on new blades, why not put on the correct ones? 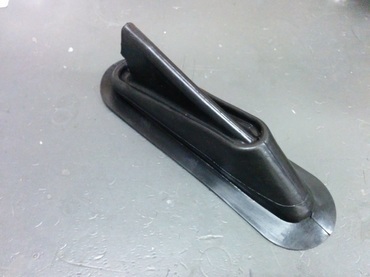 Wiper Arms for 1968 to 1977, 911, 912, 912E, and 914 Exact SWF reproduction. $50 a pair. Cast in Zinc alloy just like the originals and quad chromed here in Seattle Washington by the best specialty hotrod chrome shop around. $90 each w/ correct seal, back in stock! Yes, they are finally available. Made in the USA, die cast zinc metal just like the originals. Quad chromed, better than triple chrome plating with a copper layer, then two layers of nickel before the chrome is put on. ​Special price $170 per pair. as our chrome version, just a different finish! $735 plus shipping, when purchased direct, not through eBay. Accurate right down to the correct finish on the bolts. Rugged all steel tubing, fully chromed not just polished stainless. Heavy steel brackets mount firmly to the gutter. Rubber and plastic cover the gutter clamps so the paint isn't harmed. Chrome is back! $775 plus shipping when purchased direct, not through eBay. 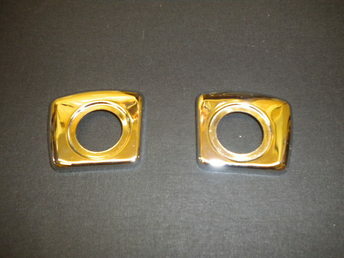 Horn Grills for Fog lights for SWB are now available!. Horn grills for fog lights! Our exact reproductions for both SWB 65-68. Actual SWB reproduction featured at left. Satin stainless steel just like OEM. Correct pattern and fitment and the holes line up!Polished available as well. Includes rivets and correct rubber molding. ​Update! We have new samples arriving soon, hopefully we can approve these and be back in stock by mid May! Replace your cracked and crumbling knob covers with perfect soft and pliable new covers. Another perfect reproduction. These are done in stainless steel and then chromed, just like the factory did. $100 per pair, or $50 each. Please specify drivers or passenger side when ordering singles.